Ulaanbaatar (Улаанбаатар) — also Ulan Bator, UB, or in the local language, Khot ("the city") — is the capital and the largest city in Mongolia. Ulaanbaatar is disproportionately larger than all other cities in the country: with a population of 1.34 million as of January 2016, approximately 44% of the country lives here. It is located just east of the center of the country in the forest-steppe region close to the birthplace of Genghis Khan. Ulaanbaatar is a city where authentic Mongol culture thrives in an urban setting, which has made it a destination in its own right. After stagnating in the 1990s, the economic situation in Ulaanbaatar has improved — nowadays the city center is clean and developed, with modern skyscrapers, hotels, and malls showcasing local and international brands. The city is known for its impressive museums, old monasteries, high quality restaurants, cinemas, theatres, and proximity to scenic natural spots. In 2016, after extensive preparations, the city hosted the 11th Asia-Europe Meeting. Ulaanbaatar is a city of many different and distinct layers. Long gone are the days when this city was just a typical, drab Soviet-bloc town in the middle of nowhere. The first layer, the natural setting, is what may be called pre-1778 Ulaanbaatar. Ulaanbaatar lies in the Altan Tevshiin Kundii (Valley of the Golden Cradle), a scenic spot was chosen by the lamas and nobles in 1778 as the permanent site of the city. Here the rivers Selbe and Tuul meet at the foot of the imposing Bogd Uul Mountain. Located in the forested and watered zone of northern Mongolia, it resides near the 2,000-year-old royal tombs of the Xiongnu, the 8th-century Turkic inscription of General Tonyukuk, and the birthplace of Genghis Khan. From the 20,000-year-old Paleolithic settlement on the Zaisan monument to the 12th-century palace of the Nestorian Christian monarch Toghrul, there is a lot to learn and discover about this deep first layer of Ulaanbaatar. The second layer is the Urga of 1639-1778, the unique mobile monastery that survives today as cultural forms (Genghisid memory, Mongolian temple architecture, wooden fenced ger districts, Mongolian script, and Buddhism, traditional clothing, festivals, wrestling, music), and as physical artifacts kept in museums (Zanabazar masterpieces). The third layer is the Urga of 1778-1924 which can be found in surviving buildings such as the Gandan monastery. The fourth layer is the socialist period of 1924-1990 which saw the destruction of temples, the confiscation of private property, and Stalinist purges, but also the emergence of Mongolia as a modern, independent nation with Ulaanbaatar as its main showcase. The fifth layer, corresponding to the decade of the 1990s, was a stagnant period marked by poverty and bread lines which left a poor impression on the few visitors who passed through the city after its opening from communism. The sixth layer is the Ulaanbaatar of 2000 to the present: modern and cosmopolitan. Despite this new layer, the city is ringed by less developed ger districts that cause air pollution in winter that lasts through March. Peace Avenue (Enkh Taivny Örgön Chölöö) is the main street, stretching from east to west through the center with shopping and restaurants all along it. This street dates back to old Urga when it was called the Chölöö (Broad Avenue). The Chinese financed its paving in the 1950s. The street passes by the southern edge of the central square, Chinggis Square (formerly known as Sükhbaatar Square), which has roots in the central square of old Urga. The tourist information office is located in the south flank of the town hall in the western corner of Chinggis Square. The city center is defined by the Ikh Toiruu (Great Ring Road) which has its origin in the prayer route of pilgrims circling the central temple-palace complex of Urga. Peace Avenue crosses the middle of the ring road horizontally while the southern part of the ring road is the Narni Zam road ("Road of the Sun" built with Japanese support). South of the Narni Zam road is the affluent southern part of Ulaanbaatar with luxury apartments lining the Tuul River. Ger districts line the northern part of the city center and stretch 7 km north to the Dambadarjaalin Monastery built in 1765. North of Dambadarjaalin Monastery starts the Zuslan or summer vacation area, where charming summer houses stretching 14 km to Khandgait. Almost every family in Ulaanbaatar has a zuslan building where they spend the summer among the forests and natural scenery of the Selbe river valley. Some herding families graze their horses and cows freely in this area. The scenery gets more dramatic going east towards the Terelj area with big rock formations and wildflower valleys. Tours go past Terelj to the 1740 Gunjiin Sum Princess Temple and the Khagiin Khar lake. The southern edge of Ulaanbaatar is marked by its boundary with the town of Zuunmod on the south side of the Bogd Uul mountain. The 1778 shrine of Tsetsee Gun on the peak and the 1747 ruins of the Manjusri Monastery are located on top of the mountain. South of the mountain starts an endless sea of grassland steppe gradually merging into the Gobi Desert 300 km south of UB. Day trips to the east include the Tsonjin Boldog Genghis Khan Statue. Day trips to the west include the Khustain Nuruu National Park, Aglag Meditation Center and Ögii Lake. At the time when Ulaanbaatar was founded as Urga in 1639 by Genghisid nobles, Mongolia was actually a serious contender for power in East Asia. The last Great Khan, Ligdan, had died in 1634, and Manchus were rising in the east — but the independent Mongols had been revitalized by a Buddhist renaissance in the 1570s, and raids under Altan Khan were carried out as far afield as Beijing. A firmer union of the Western Oirats and Eastern Genghisids would have sufficed to fend off the Manchus. The 1640 Mongol-Oirad Code of Law united the East and West, but this union failed to last long. What did survive from this period was the union of the Eastern Mongols cemented in 1639 with the founding of Urga. The Mongol nobles installed one of their own, Zanabazar, the son of Tüsheet Khan Gombodorj (1594-1655) and a direct descendant of Genghis Khan, as the supreme lama of the Mongols. His residence, called Örgöö or Urga, meaning "palace-yurt", was some 250 km west of the current site of the city, near the ancient Mongol capital of Karakorum. In 1651, the first Jebtsundamba Khutughtu, Zanabazar, returned from studies in Tibet and established seven monastic departments in Urga. The mobile monastery gradually became a mobile city, moving every few years as needed. Urga was moved 25 times between its founding in 1639 and settling in its current location in 1778, by which time it had several thousand tents and temples and was served by trade routes from China and Russia. It was also estimated to have about 10,000 monks. The Gandan Monastery was established in 1809 and became the center of learning for all of Mongolia, and one of the most important monasteries in Tibetan Buddhism. The city continued to grow through the 19th century as a provincial capital of the Qing Empire and a center of religion and trade. Russian influence in Mongolia became significant in the late 18th Century, and a two-storey Russian consulate was opened in 1865 as an upgrade from the 18th-century wooden quarters of the Russian representative. Mongolia was, in practice, a buffer between Russia and China, with plenty of local autonomy through the Bogd Jebtsundamba and Mongolian nobles. In 1911, the 8th Bogd Khan declared independence from China, leading to a long unstable period in the city's history including an occupation by a Chinese warlord in 1919. However, the Chinese were kicked out by the White Russian Roman von Ungern-Sternberg, aka the "Mad Baron", in 1921. This forced the Soviet Union to intervene and set up a puppet state in what was then known as Outer Mongolia. The country was nominally independent but essentially a satellite state of the USSR. In 1924, the city's name changed from Urga to Ulaanbaatar ("Red Hero"). Many of the monasteries and temples were destroyed in the religious purges of the 1930s. Following the end of the Second World War, the old ger districts were largely cleared out for Soviet-style city apartments, offices, and factories. The Trans-Mongolian Railway was completed in 1956, connecting Ulaanbaatar to Beijing and Moscow. Gandan Monastery was reopened during a visit by US Vice President Henry Wallace in 1944, when he asked to see a monastery. Since the democratic revolution in 1990, the population of the city more than doubled to over a million, with thousands moving in from the countryside. The commercial and residential real estate sectors have boomed since 2000, though large factories have closed and much of the city still lives in ger districts. Although summer temperatures are around 20°C, the city shivers in sub-zero temperatures for five months of the year. January and February are the coldest months, with temperatures hovering between -15°C to -30°C at night. As a result of these prolonged periods of intense cold, the city has an average annual temperature of -1.3°C, giving it the dubious distinction of being the world's coldest capital. The cold is dry, however, and there is not much wind chill due to temperature inversion. Heat island effect also means the city center is warmer than the outskirts. Summer can be very hot at times, so one should avoid heat stress and use sunscreen when necessary. If you have breathing problems, be aware that Ulaanbaatar has high levels of air pollution during the winter. However, away from the city, the countryside air is gorgeous. In winter, air pollution starts at 19:00, when ger district residents start burning coal for heat, and lasts till about 10:00 the next morning. It is severe in northern parts of the city close to the ger districts, but gets sparse going south from Chinggis Square and is almost absent near Zaisan, at the southern edge of the city where there are no ger districts. The air pollution lifts in early March and the city remains pollution free (excluding car exhaust) until November. 47.843056106.7663891 Chinggis Khaan International Airport (ULN IATA Many locals still call the airport by its old name, "Bouyant Uka") (is located 18 km to the southwest of Ulaanbaatar). The majority of visitors arrive in Mongolia through this airport. The airport was reconstructed in 1990, and the immigration, customs formalities and luggage delivery are relatively efficient. The airport does have a high number of cancelled or delayed flights because of difficulty landing when wind is blowing from the south, which luckily is not very often. Getting to the airport can take as long as an hour during morning or evening traffic. Local buses #7 goes to the airport, while number 9 runs along the road at the front - just walk directly ahead out of the terminal straight up to the road and the bus stop into town is obvious. Taxis to and from the airport should cost 15,000–20,000₮, though you should agree to the price before getting in lest you get overcharged. The drive can take anywhere from 30 minutes to an hour. A new Japanese-built airport, now known just as "New Ulaanbaatar International Airport" has been constructed about 50 km south of the city. Construction was reportedly finished in 2017, but it will open to traffic only in August 2019, thereby replacing the current airport. Direct (if long) journeys are possible from destinations between Moscow and Beijing on the Trans-Mongolian line of the Trans-Siberian Railway. Ulaanbaatar-bound trains leave Beijing once a week, on Wednesday, and seats can only be reserved at the International Hotel in Beijing, a ten minute walk north of the main rail station. The journey takes about 30 hours. Packing a face mask might be a good idea as sandstorms in the Gobi desert may cause difficulty in breathing. Shorter-haul trains also run to the Chinese border towns of Erlian and Jining 3-4 times a week. Ulaanbaatar's 47.90865106.883952 train station is located on Narni Zam road, about 3 km west of the city centre. The cheapest option is the daily 18:05 departure to Zamyn Uud on the Mongolian side of the Chinese border. You can buy a connecting bus ticket from Zamyn Uud to Erlian on the Chinese side for 10000₮ in the railway office in Ulaanbaatar. In Moscow, trains to Ulaanbaatar depart Tuesdays, Wednesdays and Thursdays (the latter two are express runs), for a journey that lasts 100 hours or a little over 4 days. There's also a daily train to/from Irkutsk, which can also be reached from Vladivostok at the eastern end of the Trans-Siberian. What few paved roads exist in Mongolia generally go to and from Ulaanbaatar. Thus, getting to UB from elsewhere in Mongolia on a paved road is very easy, because all you have to do is just follow the pavement. However, if you're driving one of the dirt tracks that characterize the majority of the country's road network, it pays to have a map. Coming from the north, the paved road starts at the Russian border at Sühbaatar. Coming from the south, the paved road starts at the Chinese border at Zamyn-Üüd, passing through the vast Gobi Desert along the way. Coming from the northeast, the paved road starts at Bulgan. Finally, from the west, the road starts in either Bayanhongor in the southwest or Tsetserleg further north. Once in the country, it should not be difficult to find a bus going to UB, at least from larger towns. However, bus stops are difficult to locate, with buses usually just stopping in populated areas. Furthermore, Mongolian buses are notorious for being late — in some cases by a day or more. Buses from Russia, the west, north and south usually go to Dragon Center, while those from China and the east go to Bayanzurkh bus station, just east of the Officer Monument at the east end of Peace Avenue. 47.91053106.82053 Dragon Center (драгон). The primary bus station for all buses going to the west, north, and the Gobi. 47.91272106.993194 Botanical Gardens (ботаник) (1 km east of the eastern traffic circle). The gardens have been completely destroyed, but the location is well known to the locals. Serves inter-city buses to Eastern Mongolia. From Russia, there are also UB-bound buses from Ulan Ude, leaving at 07:30 from the old bus station (Старый Автовокзал) via the Altanbulag border crossing. The trip usually takes about 12 hours, including customs processing — much faster than the train — and tickets cost RUB1800 one-way. There are also night buses that leave on Fridays and Sundays at 19:00. Buses arrive and depart from the Dragon Bus station. Any travel agency should be able to book tickets or you can buy them at either bus station. Street names are rarely known by Mongolians, and they usually only appear on maps and official addresses. Official addresses list the district, microdistrict (usually a large block bounded by major streets), and the building number. However, since blocks can have dozens of buildings, with more continuously being squeezed in between existing ones, addresses are not very helpful for navigation. Instead, it's best to have directions for major landmarks using lots of descriptions (i.e. "turn right at the first traffic signal west of the State Department Store"). Some major streets to know are Peace Avenue, UB's main road which runs west-to-east in front of Chinggis Square; Chinggis Boulevard, running north-to-south on east side of the square, then veering west toward the airport in front of Bogd Khan Winter Palace; and Seoul Street, which runs west from Chinggis Boulevard just south of Chinggis Square. Taxis are cheap: the going rate is around 1000₮ per kilometer, but if you're a foreigner, they'll overcharge you and there's really no way to get around it completely. (In extreme circumstances, opportunistic younger drivers have been known to try to hold passengers or their luggage at ransom until they pay extraordinary amounts of money!) A good tip is to carry a small written note with an amount in tögrög (500₮, 1000₮, 1500₮, etc.) and show them exactly what you are willing to pay before you get on. A ride from the airport to the city center should cost you no more than 20,000₮, but most drivers will try to charge you at least 30,000₮. You may get a better and more reliable deal by seeking out older drivers in their own cars, rather than the official yellow cabs. UB also now has a fleet of new white cabs with large LCD-screen fare meters on the dash. Always negotiate the fare in advance, don't be fooled by tricks like "I meant 3000₮ for each of you", and avoid random cars that offer taxi service. Help Taxi, ☎ +976 99652371. Fluent English-speaking dispatch, all drivers have at least limited proficiency in English. Main taxi service for all the embassies. 1000₮/km, minimum 4000₮, airport to city center 30,000₮. iTaxi, ☎ +976 77171717. English-speaking dispatch, metered taxi rides, texts you when the taxi arrives to pick you up. 1000₮/km, airport to city center 20,000₮. Buses in UB come in several different varieties. At the top of the scale, regularly-scheduled municipal buses operate on a widespread network that extends right to the outskirts of town, for a flat rate of 500₮. As well, there's an almost equally extensive network of microbuses charging from 300-500₮, which you can find by looking for a person hanging out the window at each stop and shouting the name of the destination in rapid-fire Mongolian. Finally, there's also a cheaper (300₮) but slower and less extensive network of electric trolleybuses. To use the municipal and trolleybuses you need a U card, which can be purchased at many kiosks and shops for 3000₮. You load credit and touch it to the reader when getting on the bus. If you touch it on the reader when getting off you can get a second ride for free if you board within 30 minutes. As in any city, be wary of pickpockets on the buses, especially when the buses are crowded. Within the quite compact city center, walking is a viable option. Ulaanbaatar stretches from east to west along just one main drag (the aforementioned Peace Avenue), making navigation a cinch. However, once you leave central UB and get into the ger districts, it's a different story entirely: a good city map, which you can get at the airport or the Mongolian Government Map Shop, is a must if you plan to go off the beaten path. You'll find the map shop directly on the Ikh Toiruu ring road: head west three blocks from the State Department Store, then turn right (north) at the first traffic light and proceed for about half a block. The Map Shop is behind the blue and yellow Elba Appliance store. Most tourist sites have a separate camera/video fee (typically 5000-10,000₮) in addition to the entrance fee. 47.91475106.918431 Choijin Lama Monastery (one block east of the National Library), ☎ +976 11 32478, e-mail: info@templemuseum.mn. Daily 09:00-19:30 in summer, closed on Sundays and Mondays during winter. These five temples and five arched gates are a unique showcase of religious art and the history of Buddhism in Mongolia, a gem of 20th-century Mongolian cultural heritage, and a fine example of Buddhist architecture. Choijin Lama Monastery was active until 1938, was inscribed in 1941 on the list of historical and cultural monuments, and became a museum the year after. In the main temple you'll find the sculpture of the Choijin Lama and the embalmed mummy of his teacher, as well as the great coral mask of Begtse, created under the direction of protectors using over 6,000 pieces of coral. Elsewhere in the complex, Yadam Temple and Amgalan Temple contain rare artifacts made by the famous Mongolian artist and sculptor, Zanabazar. 8000₮, students 3000₮, children 1500₮, photography fee 50,000₮. 47.92248106.895342 Gandantegchinlen Monastery (Gandantegchinlen Khiid or Gandan Monastery). The main monastery in the city has services around 10:00 every morning. It is one of the few monasteries in the country that was spared during the Communist purges of the 1930s. 4000₮. 47.89666106.907833 Bogd Khan Winter Palace Museum (about 2½ km south of Chinggis Square, on Chinggis Avenue in Khan Uul district). 10:00-17:00. Built between 1893 and 1903 by Mongolian masters, this palace was dedicated to the VIII Bogd Gegeen, head of Tibetan Buddhism and Khan of Mongolia from 1911 until 1924 (the last three years of which were as a constitutional monarch). Upon his death, the palace became the first national historical museum of Mongolia. The museum contains twelve collections showcasing valuable objects and works of art from the 17th to early 20th centuries (notable among which are gilded bronze sculptures by the first Bogd Javzundamba Zanabazar and his school, 19th- and 20th-century thangka paintings, a Jugder painting of Ulaanbaatar in 1912, and works by modern Mongolian painter B. Sharav), as well as personal possessions of the Khan and his wife, Queen Dondogdulam. Admission 8000₮, 50,000₮ photography fee. 47.9233106.90594 [dead link] Central Museum of Mongolian Dinosaurs (Freedom Square, next to Tengis Cinema and directly behind State Department Store). The complete fossil of the Tarbosaurus bataar — a close cousin of the larger T. Rex that serves as the centerpiece of this museum's impressive collection — was stolen from Mongolia by American archaeologist Eric Prokopi and auctioned in New York for $1 million. The ensuing news coverage set off an international criminal case that resulted in Prokopi's arrest and the return of dozens of dinosaur fossils to Mongolia by the U.S. government, which make up the bulk of this museum's collection. Located in the former Lenin Museum on Freedom Square, the Central Museum of Mongolian Dinosaurs contains a couple dozen other complete dinosaur fossils besides the Tarbosaurus, all of which were found in the Gobi Desert. 2000₮. 47.91746106.941725 International Intellectual Museum (IQ Museum) (on Peace Avenue in Bayanzürkh district, in front of East Center), ☎ +976 11 461470, e-mail: mitgel@yahoo.com. M-Sa 10:00-18:00. This museum not only displays but also manufactures and exports a wide variety of traditional Mongolian puzzle toys, logic games, handcrafted products, and souvenirs, and has launched over 80 international exhibitions and fairs in 50 countries. 2000₮, children 500₮. 47.91521106.920796 Museum of Victims of Political Persecution (100 m south of the east side of Chinggis Square). M-F 09:00-17:00. The museum is dedicated to the memory of the roughly 30,000 people that died during the religious purges ordered by the communist leader Choibalsan in the 1930s. There are plenty of sombre exhibits concerning these deaths as well as the destruction of monasteries and religion. Very little is in English, so the museum's contents may be hard to follow. 5000₮. 47.92036106.915387 National Museum of Mongolia (just west of the Government House). Tu-Sa 08:00-22:00, last entry 20:30. This is the main museum in the capital and should be a first stop on any visit to the city, as it holds the most important artifacts of Mongolia's rich history dating back several thousand years. These include ethnographic displays of different Mongolian tribes, petroglyphs and cave drawings, Turkic monuments, weapons, armor, and various displays from throughout the different eras of Mongolian history: the Hun and Mongol Empires, Chinese rule, the Communist era, and the democratic revolution of 1990. There are displays of self-portraits and personal possessions of Genghis Khan and other great khans of the Mongol Empire. Most displays are in English and Mongolian. Admission 5000₮, photography fee 5000₮. 47.91961106.921098 Mongolia National Modern Art Gallery (at the Central Cultural Palace on Chinggis Square), ☎ +976 11 327177, e-mail: info@art-gallery.mn. Daily 10:00-18:00. A surprisingly good modern art museum that displays the vibrancy of the local art scene. There are temporary exhibits throughout the year as well as a permanent collection. 2000₮, students 1000₮, children 500₮. 47.92013106.909119 Zanabazar Museum of Fine Arts (two blocks west of the Government House, on Barilgachdin Square), ☎ +976 11 326060, e-mail: info@zanabazarfam.mn. 08:00-17:00 (summer), 10:00-17:00 (winter). The collection includes items from the Stone Age through to the 20th century. Particularly interesting is the collection of Buddhist art from the 17th century and later. 5000₮. 47.91898106.9177710 Chinggis Square (formerly Sükhbaatar Square). The big open space in the center of the city with an equestrian statue of Damdin Sükhbaatar, warrior-hero of the 1921 People's Revolution, as well as a seated statue of Genghis Khan that sits at the door of the Government House. Inside the Government House is a small museum with artifacts from the Mongol Empire and a reproduction of Genghis Khan's White Peace Banners of State (the Soviets had the originals destroyed in the 1930s). 47.885106.9156411 Zaisan Memorial (about 3½ km directly south of Chinggis Square). A huge Communist-era monument located on a hill near the city depicting the Russian and Mongolian heroes who fought together during the First and Second World Wars. Nowadays it is a popular viewpoint where you can see over the whole city. There's also a huge Buddhist statue at the bottom. Despite news about the removal of Lenin's statue, Ulaanbaatar still boasts a wealth of other interesting statues and public art beyond what's mentioned above. Prominently, former Communist leaders Choibalsan and Tsedenbal are memorialized north of the Government House, as is Sanjaasürengiin Zorig, leader of the 1990 democratic revolution, at a location southwest of Chinggis Square. There are also many lesser-known statues scattered through the city: there's a bust of Stalin inside a beer garden south of Chinggis Square, some old Soviet murals on the side of apartment buildings north of the Bogd Khan Winter Palace, and you'll even see The Beatles and the villain from the movie Predator holding court in front of the State Department Store and in front of a small office building 100 m northeast of there, respectively. Bogd Uul, the mountain ridge south of town, is a great place for a hike. To get there, take the #7, #33 or #43 bus from in front of the Bayangol Hotel to the south end of the line. From there, the road continues south about 100 m, whereupon you'll come to a checkpoint where you'll be charged a fee of US$3. Proceed, bear left when the road forks, and you'll soon find yourself in a ger camp with a small stream flowing north. This is where the hiking path itself begins, on the left (east) side of the stream. At the top of the ridge, veer west and proceed through the woods for an easy amble of about two or three hours (you'll come to a high point about 500 m past the turn). At the end of that stretch, you have the option of either branching off to the west or else continuing straight and slightly east to Bogd Uul Mountain (this path is marked with orange paint marks on the trees). That part of the trip is quite long — about 10 km one-way — and more challenging, with varying elevations. 47.8728107.045371 Sky Resort (13 km from city center. Go south to Zaisan, then east along the river past the President's Residence), ☎ +976 11 320345, e-mail: info@skyresort.mn. 07:00-22:00. A winter sports resort offering downhill skiing, snowboarding, lifts, equipment rental, ski and snowboard school, and an onsite restaurant. There's a free bus from the Drama Center (next to the Grand Khan Irish Pub) with departures between 08:00 and 19:30 (frequent service on weekends, more sporadic midweek; check schedule to verify bus times). Under US$20. 47.90214444106.916252 Naadam. 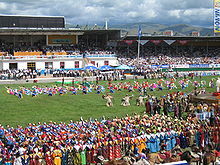 The largest and most famous festival in Mongolia, Naadam is held yearly from July 11-13 and consists of competitions in the three traditional Mongolian sports of wrestling, horse racing and archery. The 47.90258106.915383 National Sports Stadium, besides being the main venue for the festival, also serves as the country's main football and baseball stadium as well as a venue for occasional concerts and cultural events. 47.91507106.914734 National Academic Drama Theater (in the red Georgian building just south of the Post Office on Chinggis Avenie). Mostly presents Mongolian plays in drama, musicals, or children performances. Tickets are sold at the "KACC" office in front. Prices vary, generally cheap for Mongolian language performances. 47.91206106.907765 State Circus of Mongolia (on Seoul Street south of the State Department Store). Home to the world famous Mongolian contortionists, where most of the world's professional contortionists get their start. The circus also features animals, jugglers, and other entertainment. 47.91843106.919246 State Opera and Ballet Theater (National Academic Theatre of Opera and Ballet of Mongolia), Chinggis Square (in the pinkish building on the southeast side of Chinggis Square), e-mail: opera_ballet@yahoo.com. Box office W-Su 10:00-13:00, 14:00-17:00. While visiting Chinggis Square, it may be worthwhile to check out the board in front of this theatre to see if there is an upcoming performance. Most performances are at 17:00 Saturday and Sunday. Local performances may not be great, but are very cheap. Ballet troupes and opera companies from Russia also occasionally visit. Prices vary by performance, local productions can be very inexpensive. Get an inexpensive massage at one of the many massage spas located on Peace Avenue. 47.90842106.92378 National Amusement Park (Children's Park) (500 m south of Chinggis Square). Daily 11:00-19:00 year round. Open since 1969, the park today features a steel roller coaster, a Ferris wheel, a castle surround by an artificial lake, and bowling. 1000₮ to enter plus extra for each ride. The 47.91964106.90871 American Center for Mongolian Studies (ACMS) provides in-depth insight into Mongolian culture for those looking to get to know it through a more academic approach. The center has a study room and library of Mongolian-related material, with Internet access. You'll find it on the campus of the Mongolian National University, on the third floor of Building #5. As well, there are several Mongolian language schools throughout the city. It's essential for visitors to Ulaanbaatar to carry cash, as only a few of the more expensive shops in town accept foreign credit cards. Thankfully, it's relatively easy to find an ATM with a Visa logo to withdraw cash. All ATMs should accept foreign credit and debit cards to withdraw tögrög (the local currency) as long as you have informed your bank ahead of time as to your Mongolian travel plans; most will charge you a foreign currency conversion fee of about 3%. Besides Visa, other card types are also accepted, but not as widely: for example, the machines in the Central Post Office and along the main street will not accept foreign MasterCards, although they bear the logo. The only ATM that accepts Cirrus cards is the one at the airport. UB also has many banks and exchange offices where tögrög can be obtained. Golomt and TDB are the most reliable banks for currency exchange, the former of which can give up to US$500 per day cash advance on MasterCard and Visa and also accepts American Express. Exchange offices can mainly be found along Peace Avenue in the city center, including one on the ground floor of the State Department Store. However, you'll find better rates at the one on the second floor of the Flower Center, on Peace Avenue one block west of the Post Office. Lastly, major hotels like the Ulaanbaatar Hotel will exchange money 24/7 at the reception, which may be your only option if you arrive very late in the day. See Mongolia#Money for exchange rates for the tögrög. 47.90814106.946451 Naran Tuul (Black Market) (3 km east of the children's park on Narni Zam road). Closed on Monday. The main market for most of the city's residents, Naran Tuul is the place to go if you want to shop like a local. Haggle over cheap clothes, toys, fur hats, vintage Soviet propaganda pins, or anything you can imagine in a vast, partially indoor retail emporium located a 10-minute bus or taxi ride from the city center. There are also several slightly more upscale shopping centers just west of the market. Only take a minimum of cash with you in a money belt or inner jacket pocket and leave all valuables at your accommodation, as pickpockets are common here. 47.91667106.906382 State Department Store (Ikh Delguur) (west of Chinggis Square on Peace Avenue). Daily 10:00-22:00. Formerly a state-owned department store (hence the name), today it is the busiest luxury shopping mall in the city, with everything from groceries to cashmere to TVs sold on all six floors of the building. Though privately owned nowadays, the customer service still has a certain impersonal, bureaucratic feel. Check out the fifth floor for the largest souvenir shops in UB. 47.92285106.881443 3rd & 4th Microdistrict (northwest side of Gandan, 2 km north of the train station). You'll find several malls, name-brand stores, restaurants, supermarkets, curbside booths, and a movie theater at UB's largest shopping district. Selection ranges from luxury brands down to cheap Chinese imports. Ulaanbaatar has a host of souvenir shops aimed at both Western and East Asian tourists, mostly along Peace Avenue west of Chinggis Square. Traditional clothes, boots and hats, cashmere garments, jewelry, leather wall hangings, miniature gers, bow and arrow sets, and paintings are among the typical inventory. While the quality of the goods varies, prices are usually high. 47.91691106.912184 Flower Center (corner of Peace Avenue and Ikh Toiruu ring road, west of Chinggis Square). One of the larger souvenir shops in the city; a broad selection, but a bit pricey. There is a money exchange center on the second floor. 47.91739106.910115 Mary & Martha (north of the State Department Store bus stop, look for the signs), e-mail: info.mmmongolia@gmail.com. A small free-trade shop full of beautiful handmade souvenirs, handbags, and wall hangings. 47.9224106.91796 Librairie Papillon (on University Avenue, just past the main Mongolian National University building). If you want to find very high-quality English-language books about Mongolia, resources for learning the Mongolian language, or simply a selection of classic literature to read on your journey, this place has a very large selection. The atmosphere is almost like taking a little break from Mongolia and entering France. 47.91585106.90517 Mike's Bookstore (south of the Bayangol Hotel, west of the New Building), ☎ +976 9903 6703. Here you can not only buy used books, but sell your old ones. There's even a buyback policy. Selection is mostly but not exclusively English-language. Nobody travels to Mongolia for the food, but Ulaanbaatar has a good range of options serving Mongolian, other Asian (particularly Korean and Chinese, though like their North American counterparts, flavors tend to be tailored to the local palate), and Western cuisine — and at decent prices. For instance, you can get perfectly good pizza for 5000₮, and even a night out at a fancy French cafe shouldn't pass 30,000₮. Consider splurging on a couple good meals here, especially if you're headed out for a long trek into the country where things like fresh vegetables are often hard to come by and prohibitively expensive. Best of all, UB's rapidly growing wealth has meant a steady procession of ever newer, ever higher-quality restaurants, as well as the appearance on the scene of international chains like KFC, Round Table Pizza, and Cinnabon. Throughout Ulaanbaatar are many small canteens (Гуанз) and coffeeshops (Цайны Газар). Try one of these for cheap Mongolian food. Buuz usually costs 400-600₮. As well, most universities (particularly the Mongolian National University and the Mongolian University of Science and Technology) have good cheap cafeterias with meals running from 1800₮ to about 2500₮. 47.92025106.908211 Coca-Cola and Kabab (on the southwest corner of the square in front of the Zanabazar Fine Arts Museum). 10:00-20:00 daily. The specialty of the house is a meat sandwich on pita bread, grilled Turkish style on a vertical rotisserie with tomato, lettuce, and some sauce. 4000-6000₮. 47.91826106.906322 Joe's Corner Burgers (tucked between the apartment buildings behind the State Department Store). Stops serving around 21:00. Burgers and hot dogs, with fries on the side: probably the best value in UB for this kind of all-American fare. 4000-5500₮. 47.91981106.913933 Luna Blanca (across the street from and just west of the National Museum, near Chinggis Square), ☎ +976 11 9907-7885, e-mail: luna@lunablanca.org. M-F 11:00-20:00, Sa-Su 12:00-20:00. Very good quality vegan food. Attached to a Buddhist meditation center, therefore short opening hours (closes around 9pm). 47.91908106.939874 Papa Cafe (second building east from the British Embassy on Peace Avenue, next to a parking lot, on the second floor), ☎ +976 11 461687, e-mail: papacafe2010@gmail.com. M-F 10:00-21:00, Sa 09:00-21:00. Burgers, chicken burgers, espresso and baked goods. On Saturday they open at 09:00 and serve a breakfast special of one large waffle with fresh fruit, ice cream, bacon, Mongolian blueberry jam, and syrup, plus coffee and other drinks. 4000-7000₮. 47.91947106.915825 Budweiser Pub & Restaurant (across from the northwest corner of Chinggis Square), ☎ +976 8900 3025. Fish and chips, steak, English breakfast. US$6-10. 47.92653106.914456 Chinggis Club (two and a half blocks blocks north of Chinggis Square via the street passing along its west side). 10:00-24:00. The Chinggis Brewery's in-house restaurant, serving German cuisine and (of course) their own locally-brewed light and dark beers on tap. US$10. 47.913106.863677 Hishig Mongol 2 (on Peace Avenue several kilometers west of the State Department Store, near the third hospital), ☎ +976 7018 0585. If you want to experience real authentic Mongolian cuisine, this is the place. Serves roasted sheep head, roasted ribs, buuz, and dried meat soup. No foreign-language menu or staff, though. US$6-10. 47.91433106.91798 Millie's Espresso (on the west side of the Choijin Lama Monastery), ☎ +976 11 33 0338. 08:00-20:00. Good selection of American-style coffeeshop fare, including some vegetarian options. Free WiFi. US$10. 47.91991106.907549 Nayra Cafe (two blocks west of the Government House), ☎ +976 11 31 7098. opens 08:00. Good pizza and sandwiches, good coffee. Free WiFi. Most under 8000₮. 47.92617106.910110 Venus Cafe (two blocks east and then three blocks north of the State Department Store, on the left a few doors past the French Bakery), ☎ +976 1327496. lunch, dinner. Malaysian specialties including masala, roti, and spicy curries. US$10 for dinner, lunch set menu US$5. Bosco verde. Vegan restaurant just behind the circus. It's hard to spend outrageous sums of money eating out in Ulaanbaatar: the most expensive meals in the city will be around 60,000₮ a person. That is, unless you're drinking: whiskey or any other non-vodka liquors can be a bit pricey. Caucasia: Just behind the circus. Serving Armenian and Georgian cuisine. Excellent quality. Chojin: In front of the Chojin Lama Museum on the ground floor of an office building. Serves a small but excellent selection of mediterranian dishes. Very popular business dinner location for the locals. reservation recommended. Hana Japanese Restaurant. On Chinggis Avenue next to the National Library, in the first floor of an office building. Impossible to spot from the outside, just go in and ask at the reception. You get advised to follow a fire security stairways up. Despite the non-glamorous arrival, the Hana is a high-end Japanese restaurant. Elegant atmosphere. Excellent Japanese dishes including udon soups, sushi and barbecue. Meals up to 30.000 T. Including starters and drinks, be prepared to spend 50.000-60.000 T.
47.91321106.8972812 bd's Mongolian BBQ (on Seoul Street about 1½ km west of Chinggis Square, next to Ayanchin Outfitters). The type of food Westerners call "Mongolian barbecue" — stir-fried meat and vegetables cooked on a huge iron griddle — has very little to do with the actual cuisine of Mongolia. This is the place for tourists disappointed by that discovery: bd's is a U.S.-based chain specializing in this type of cuisine whose Ulaanbaatar location, opened in 2005, was the first international restaurant chain to enter the Mongolian market. Plenty of different meats are available for grilling, but this place is suitable for vegetarians too (tofu and soy protein are offered as ersatz "meats"). Check your bill before you pay because guests are charged for all-you-can-eat unless specified otherwise. 15,000₮ per bowl, 30,000₮ for all-you-can-eat. 47.91296106.9009313 California Restaurant (on Seoul Street, west of the circus). Extensive menu of both foreign and Mongolian specialties. Beautifully decorated, high-quality food including vegetarian specialties (good tofu!) It's a bit small, but in the summer there is additional outside seating. Reservations are advised. 10,000-30,000₮ per meal. 47.91728106.9351614 Hazara North Indian Restaurant (behind the Wrestling Palace), ☎ +976 99195007, +976 11 480214, e-mail: hazaraub@gmail.com. Serving spicy North Indian, Kashmiri, and Afghani food since 1997. Food is all halal, with vegan options available. Well-decorated restaurant and costumed waitresses can make you think you are in Delhi instead of Mongolia. From 10,000 ₮. 47.92601106.9180915 Los Bandidos (on Ikh Toiruu ring road, not far north of Chinggis Square), ☎ +976 1131 4167. Mexican-Indian fusion: don't knock it until you taste the spicy chicken masala or crispy taquitos. The prices are higher now than they used to be, but the atmosphere has improved along with it. US$7-10. 47.92419106.9375216 [dead link] Namaste Indian Restaurant (at the Flower Hotel), ☎ +976 99270957, e-mail: namaste.ub@gmail.com. Mongolia's first halal-certified restaurant, serves some of the best Indian food in the city. There is another location on the Outer Ring Road in the Impex building. 20,000₮. 47.915106.9070817 Turning Point Cafe (on Tserendorj Street, three blocks west of Chinggis Square via Peace Avenue and then half a block south), ☎ +976 7011 9940. Jazz-themed restaurant and bar featuring modern decor, international cuisine, and a wide range of beer, wine and cocktails. Regular live entertainment. Sandwiches for 12,000₮. 47.91293106.900718 Good Price Supermarket. 09:00-22:00. Catering to expats and well-heeled locals, Good Price is Mongolia's most reliable source of luxuries such as peanut butter, breakfast cereals, canned beans, and cheese. But don't be fooled by the place's astoundingly inaccurate name: these luxuries come at a much higher cost than any other supermarket in the country. 47.91206106.9037719 Mercury Food Market (Chinese Market). Closed on Mondays. This small market in the city center is one of the best places to get imported fruits, vegetables, and packaged goods. Nightlife in Ulaanbaatar is surprisingly wild, especially on Wednesday, Saturday, and (above all) Friday nights, when finding a seat is near impossible. If you like raving the night away to trance, techno, electronica, and house music, this is the scene for you. Beer in clubs costs about 3500₮, while other drinks such as vodka are sold by quantity: for example a 100g vodka costs about 4500₮. According to state law, clubs and pubs cannot serve alcohol on the 1st of each month, which means they all close, even if it is a weekend. Especially after dark, and especially on the aforementioned three busiest days of the week, it's best to go out clubbing in groups rather than alone: not only will you be less likely to run afoul of shady characters, but authorities take a hard line against public intoxication, and the Mongolian drunk tank is not a pleasant place to be. As well, the clubs in the 3rd district and the Sansar microdistrict are best avoided. Be sure to apologize if you hit someone or step on their feet accidentally, because this is a rather considerable breach of local etiquette. 47.91343106.915481 Ambrosia Restaurant (across Chinggis Avenue from KFC, south of the Post Office). A nice little restaurant that turns into a club at night, with good drink specials. Popular with foreigners. 3000₮ for a beer. 47.91322106.907922 Ikh Mongol (next to the Circus). Patrons of this brewpub can choose between the main dining area, the fancy VIP upstairs, or secluded tables in the back. Most weekends have concerts from Mongolian bands. In addition to the house brews served on tap, you can also get some of the more popular Mongolian brands. 3500₮ a half-liter and up. 47.91953106.874663 Mass (in the 3rd/4th microdistrict). One of the aforementioned clubs that likes to stay open illicitly past 03:00. Caters to a younger clientele. 47.9223106.93294 Metropolis (next to the Sky Shopping Center, behind Chinggis Hotel). Plan to pay 5000-10,000₮ cover to get in to this most popular nightclub with young affluent Mongolians. 47.91827106.889925 Strings (in the White House Hotel). A somewhat notorious club frequented by foreigners as well as Asian businessmen. If clubbing isn't your thing, UB also has its share of more sedate pubs to choose from. Blue Sky Tower has a cocktail bar on the top floor. Elegant environment, but usual prices. Great view on the city. 47.92385106.917946 Le Bistrot Francais (on the west side of University Street, a block north of Chinggis Square), ☎ +976 11 32 0022. Enjoy a pastis and have a nice dinner at the only French restaurant in Ulaanbaatar. 47.91302106.902847 Brauhaus (on Seoul Street past the Circus). Goes for a German brewhouse look (hence the name) and succeeds. This bar is big but usually not noisy. It serves X Beer, a quite tasty local brew. Half-liters run around 2500₮. 47.91377106.906328 Dublin Irish Pub (on Seoul Street between the State Departmentt Store and the Circus). Open until midnight. Closer to an actual Irish bar than most. 47.91529106.91429 Grand Khaan Irish Pub (next to the National Drama Theater, south of the Post Office). 12:00-22:00. A comfortable sports bar and grill with English-speaking staff. 4000₮ for a beer, 15,000₮ for a meal. During the annual Naadam festival in July, it's almost impossible to get any kind of accommodation in UB without prior reservations. Nowadays, budget accommodation in Ulaanbaatar tends to give the best deals for a traveller. Usually a bed in a clean dormitory costs US$5-10 and a double room should be under US$30 a night. Beyond what's listed below, another option for budget travellers who want a taste of authentic Mongolian culture yet are in a hurry or don't want to do longer trekking trips is a ger homestay with a herder family living in the countryside outside UB. Usually it is possible to participate in their daily life, e.g. milking cows or chopping wood. Horseback riding might be offered as well. There are a few travel agencies that are able to establish contact with families, including Stone Horse Mongolia and Ger to Ger. 47.9217106.905751 Bolod's Guesthouse and Tours (Across the street from Chinggis Square, enter through gate across from Post Office), ☎ +976 99192407, e-mail: u_borchy@hotmail.com. Still UB's most conveniently located guesthouse, but the place has gone downhill in recent years: where cozy, high-ceilinged, clean and bright rooms once greeted you, you now have small, windowless rooms with noisy refrigerators that wake you up several times a night. There's also no kitchen anymore. The shower, located in the entrance, is clean, but your privacy is only protected by a translucent glass. English-, Russian-, French-, and Italian-speaking staff are on duty during the daytime only. No credit cards are accepted. Bolod also provides tours at good prices and is known to arrange unique trips involving tank driving and AK-47 shooting. US$7/night. 47.91492106.906042 Chinggis Guest House and Tours (on Chinggis Avenue behind the National Academic Drama Theatre and Bayangol Hotel), ☎ +976 99271843, +976 11-325941, e-mail: chingisguest@magicnet.mn. Clean and comfortable rooms with breakfast, Internet, hot shower, and use of kitchen facilities included in the price. Very centrally located and quiet. Dorm US$8, double or twin US$10. 47.9216106.89913 Gana's Guesthouse (on Ikh Toiruu ring road northwest of Chinggis Square), ☎ +976 1136 7343, e-mail: gharchin@yahoo.com. This guesthouse stands out from the rest: rather than the standard setup of spartan dorm rooms with bunk beds, guests are accommodated in roomy gers set up on an airy porch in an excellent central location overlooking downtown UB, only two minutes on foot from Gandan Monastery. Run by a friendly, helpful family, who like most guesthouse proprietors also double as tour operators. From US$5 in a 6-bed ger to $25 for a double in the newly built wing. 47.91756106.908154 Golden Gobi (off Peace Avenue close to the State Department Store), ☎ +976 11-322632, +976 96654496, fax: +976 11-322632, e-mail: golden_gobi@yahoo.com. Another cheap and friendly place with free breakfast. Dorms US$6, private rooms from $19. 47.91735106.908715 Green Steppe Mongolia Guest House (50 m east of the State Department Store, off Peace Avenue), ☎ +976 88033080, +976 88038388, e-mail: greensteppemongolia@gmail.com. Check-in: anytime, check-out: noon. A small and quiet guesthouse comprising a couple of dorm rooms and two fully-furnished one-bedroom apartments, with a pleasant patio out back for picnicking. Friendly staff can organize tours to all parts of Mongolia. Complimentary amenities include breakfast in the morning and tea all day, wireless Internet as well as two wired computer terminals, lockers for guests, secure parking for motorbikes and bicycles, hot showers, and cheap laundry service. US$6/night. 47.91121106.894466 Idre's Guesthouse (on Narni Zam road about 2 km from Chinggis Square; take Seoul Street west then turn left), ☎ +976 99112575, e-mail: idrehouse@yahoo.com. Friendly family-run guesthouse with US$4 dorm beds. Rooms are clean, staff are helpful, and tickets and tours can be arranged without hassle. 47.92448106.912087 Lotus Guesthouse (northwest of Chinggis Square, on Ikh Toiruu ring road across from School #5, on second floor of Building 17), ☎ +976 11 325967. A nice and clean, if spartan, guesthouse run by the Lotus Foundation. Staff on duty 24 hours a day. Rooms have no high table except the very small one for the computer — and, importantly, no bedsheet, and the quilt is not washed between clients! The shower room doesn't lock, and is closed by a translucent door. Free but unreliable WiFi. No credit cards accepted. US$10-30/night. 47.91177106.980958 Oasis Guesthouse (on the southeastern outskirts of town, about 5 km from Chinggis Square via Peace Avenue, near the Catholic church), ☎ +976 11-463693, fax: +976 11-463693, e-mail: info@intergam-oasis.com. A modern-styled and lovingly furnished guesthouse run by a friendly German-Austrian couple who speak German, English, and Mongolian; lodging is in the spacious gers outside in the garden. Popular with "overlanders" travelling through Mongolia by car or motorcycle. Oasis' onsite café serves very good Western food including homemade cakes. There's a laundry room and hairdresser at the back of the building. €10. 47.9286106.91599 Petite Marmotte (on Ikh Toiruu ring road north of Chinggis Square), ☎ +976 70 11 03 02, +976 888 243 17, e-mail: resa@trekmongolie.com. A well-located and quiet guesthouse with rooms decorated in traditional Mongolian style. The friendly staff speaks English and French, and is headed up by a former chef who lives onsite and sometimes regales guests with tasty homecooked meals. They can also arrange tours. No Internet and no credit cards accepted. Bed dorm €5; double room €15; family room €25. 47.92461106.9126610 Sunpath Hostel (across the street from the Central Post Office and Chinggis Square), ☎ +976 99143722, fax: +976 11-326323, e-mail: info@sunpath-mongolia.com. Sunpath is a centrally-located, family-operated hostel perfect for foreign visitors offering free breakfast, free WiFi, and a publicly accessible wired computer terminal. Laundry service is available for a nominal charge. Kitchen facilities open to guests. Sunpath's friendly staff organizes tours (having very good contacts with people living in the countryside) and are a wealth of information about Ulaanbaatar and Mongolia in general. US$6/night. 47.91936106.9109512 UB Guesthouse (near Zanzabar Museum; entrance is in the rear of the building facing the Mongol Bank). A clean, well-organized, and centrally located youth hostel that also arranges tours around the country. E-mail ahead for a free pickup from the train station. A light breakfast, tea and coffee are included. In theory you can use the phone between 10:00 to 18:00, but don't count on it. There's only a hotplate in the kitchen. Only foreigners allowed. No in-room guests. Staff is not terribly friendly. Dorm beds US$6; single room $15; twin room $18; double room $20. 47.9167106.9016913 Zaya Guesthouse (just off Peace Avenue west of Chinggis Square), ☎ +976 11 331 575, e-mail: backpackza@hotmail.com. Zaya has two locations in the city center, both in newly-renovated modern apartment buildings. The place is more suitable for a person looking for clean and calm place to sleep than a backpacker looking for a rowdy and noisy dorm. Free wireless internet in the rooms. They also organize tours. US$20 for a single and US$27 for a double room. Ulaanbaatar has plenty of options for budget travellers and big spenders, but not so much for those in the middle. 47.91758106.9036214 Mandukhai Hotel (near State Department Store). Check-in: noon, check-out: noon. A nice inexpensive hotel located in the city center. The hotel staff speaks little English, but rooms are large and include TV. Bathrooms are shared. 20,000-25,000₮/night. 47.915148106.94451215 Royal House Hotel (formerly Red Rose Hotel) (on the ring road east of the city center; take Peace Avenue east from Chinggis Square for about 2 km and then turn right), ☎ +976 11 46 4088. One of UB's leading hotels, with a location among a cluster of major shopping centers and office buildings. 34 rooms of various levels of luxury: deluxe, semi-lux and standard. 47.91203106.9136516 Bayangol Hotel (two blocks south of Chinggis Square). Close to the bars and Chinggis Square, but rooms are small and the internet cuts in and out. 47.91674106.9185117 Blue Sky Hotel and Tower (south side of Chinggis Square), ☎ +976 7010 0505. The tallest building and the most expensive hotel in Mongolia. 200 rooms, plus several nice restaurants and bars including a lounge on the 23rd floor with views of the whole city. From US$200. 47.92207106.9341518 Chinggis Khaan Hotel (four blocks east of Chinggis Square; take Beijing Street east for about 1200 m, then turn right on Tokyo Street), ☎ +976 700 000 99, e-mail: reservation@chinggis-hotel.com. Spacious rooms that can be described as "wannabe luxurious". Free and very reliable high-speed WiFi. Breakfast is included in the price of the room. 47.91299106.9135519 Corporate Hotel (on Chinggis Avenue, seven minutes on foot south of Chinggis Square). Nice luxurious rooms as well as sauna, jacuzzi and free WiFi. 47.971077106.48004520 HS Khaan Resort Hotel, Khui doloon hudag, Argalant soum (about 12 km west of central UB via Highway 3), ☎ +976-9908-8102. A ger-style resort in the countryside outside of town. All rooms have sweeping views over the steppes. 47.91982106.9436521 Kempinski Hotel (about 2 km east of Chinggis Square, at northeast corner of Peace Avenue and Ikh Toiruu ring road), ☎ +976 11 463 463, e-mail: reservations.ulaanbaatar@kempinski.com. A nice hotel on the east side of the city with several good restaurants, including Kara-Khorum with an excellent brunch on the weekends: various meats, fruit, omelet and juice bar, plus caviar and champagne. 47.91519106.8918822 Ramada Citycenter (on Peace Avenue about 2 km west of Chinggis Square, a block past Ikh Toiruu ring road), ☎ +976 7014 1111. One of the only international hotel chains in the city. Located on the top floor of the MaxMall, near Gandan Monastery. Has all the standard features of a full-service Western hotel, including fitness center, sauna, and office space. From US$200/night. 47.91862106.9226624 Ulaanbaatar Hotel (just off the east side of Chinggis Square), ☎ +976 11 320 620, e-mail: reservations@ubhotel.mn. The first modern hotel ever built in Mongolia (in 1961) is showing its age. Nice central location, though. Located on Peace Avenue at the southwest corner of Chinggis Square, Ulaanbaatar's 47.91706106.915782 Central Post Office not only sells stamps but also a wide variety of reasonably priced postcards (though they may take up to two months to reach their destination!) Also check out their large collections of decorative stamps. Mobile phone operators around town offer prepaid GSM SIM cards, handset rentals (Mobicom), and extensive roaming options. As well, prepaid cards such as BodiCom are another convenient and relatively inexpensive way to make an international call. You'll find many Internet cafes scattered around the city; the going rate is about 400-800₮ per hour. Also, many restaurants and coffeehouses offer free WiFi. While crime rates in Ulaanbaatar are said to be among the highest of any Asian city, this generally applies less to the city center than the underdeveloped ger districts on the outskirts of town: poorly lit shantytowns crisscrossed by maze-like dirt alleys and row upon row of fences; not the kind of place most tourists would be interested in to begin with. Nonetheless, it might be a good idea to avoid going out at night alone (though it's usually perfectly fine to do so in groups). This goes double for relatively deserted areas away from major routes, and for rowdy nightlife districts. Although most large buildings have security guards, they're only there to keep drunks and homeless people out, so don't expect much help from them if a crime is committed against you. Unfortunately, xenophobia is rampant, and violence towards foreigners happens often. Violence is part of everyday life in Mongolia and especially in the capital violent crime rates are among the highest in Asia. Alcoholism is a huge social problem and Mongolia has the highest rate of liver cancer in the world according to www.wcrf.org and most other reputable sources. Do not acknowledge or approach any Mongolian man under the influence of alcohol. Nearly all foreigners who go to bars / clubs at night report assault and general aggression. While muggings, assaults, and taxi scams all occasionally occur, the main crime for foreigners to be concerned about is pickpocketing. This is especially a problem at the Naran Tuul market, at the bus stops close to the State Department Store, and on crowded buses in general. If you've been attacked or pickpocketed, take time to make a deposition at the district police station, and let your country's embassy know. Though unmarked taxis are common and generally nothing to fear, it's probably a good idea to get a local to serve as an interpreter and explain the fare system, and to keep an eye on where the taxi is taking you. Sometimes unmarked taxi drivers will try to take people, especially drunk tourists, down a dark alley and demand their cell phone or cash. There's a common scam in Ulaanbaatar where a fraudster poses as the representative of a hotel, even going so far as to set up listings on usually trustworthy websites like booking.com. They'll give you the address of a random apartment block that may or may not have a front desk, despite what the website pictures depicted, and your "room" will in reality be the apartment of some hapless local. They'll generally refuse to return your deposit, and get very aggressive if you threaten to alert the apartment complex management or the police. If you end up booking a place and the owner has misrepresented themselves, just walk away before the situation gets worse — and don't forget to report the listing as fraudulent! Walking on the streets at any time is a hazardous affair, as there are open manholes, reckless drivers, and (from October to March) ice on the roads to contend with. The automobile culture in UB is too new for safe driving systems and habits to have taken root among the public: if you're crossing the street, even at a designated crosswalk and even if in theory you have the right of way, don't expect anyone (even buses and police) to stop or even slow down for you. You will get honked and shouted at, however. This is a common and persistent sight on the streets of UB that may tug at the heartstrings of well-off Western tourists, but the reality is a bit more complicated than it may look at first blush. Any money you give will often go straight into the pockets of their teenage "pimps", so your donation may not be helping the kids as much as you think. It also pays to be on your guard when they operate in groups, as this is often a setup for a pickpocketing operation. The weekly UB Post is the principal English-language source for cultural, economic, and political goings-on in Mongolia. Canada, Central Tower, 6th Floor (southeast corner of Chinggis Square), ☎ +976 11 332500. China, Zaluuchuudyn Urgun Chuluu 5 (just northeast of the Government House), ☎ +976 11 323940, +976 11 320955, +976 11 311903, fax: +976 11 311943, e-mail: chinaemb_mn@mfa.gov.cn. Cuba, United Nations Street 18, Sükhbaatar district, ☎ +976 11 323778. 47.917176106.9135173 France, Peace Avenue 12, Sükhbaatar district (west of Chinggis Square, past the Central Post Office), ☎ +976 11 324519. 47.9245002106.91716344 Germany, United Nations Street 18, Baga Toiruu 2, Sükhbaatar district, ☎ +976 11 329522. India, Zaluuchuud Avenue 10, Sükhbaatar District (just east of the Chinese embassy), ☎ +976 11 329522. 47.914638888889106.922722222225 Japan, Olympic Street 8, Sükhbaatar District (two blocks south of Chinggis Square), ☎ +976 11 320777, +976 11 313332. Kazakhstan, 11th khoroo, Zaisan Street 78, Khan-Uul District, ☎ +976 11 345408. Kuwait, Bella Vista Town, Zaisan Bella, 11th khoroo, Khan-Uul District (south of the city center, near the bridge to Zaisan Memorial), ☎ +976 7744444. Laos, 11th khoroo, Ikh Toiruu Road 59, Sükhbaatar District (massive complex on the south side of Peace Avenue, east of Chinggis Square), ☎ +976 11 326440. North Korea, Diplomatic Complex 95, Sükhbaatar District (behind the Embassy Restaurant near the Tengis Theater), ☎ +976 11 310432. Russia, 11th Khoroo, Ikh Toiruu Road 59, Sükhbaatar District (massive complex on the south side of Peace Avenue, east of Chinggis Square), ☎ +976 11 326440, +976 11 322834. Turkey, Peace Avenue 5, Chingeltei District (west of the post office, next to the French Embassy), ☎ +976 11 311200. United Kingdom, Peace Avenue 30, Bayanzurkh District (300 m east of the Wrestling Palace), ☎ +976 11 458133, e-mail: Consular.Mongolia@fco.gov.uk. Tu Th 14:00-16:00. 47.9281295106.9301786 United States (north of Chinggis Khaan Hotel), ☎ +976 7007-6001, fax: +976 7007-6174, e-mail: cons@usembassy.mn. M-F 08:30-12:30 and 13:00-17:00. 47.9185106.93437 Vietnam, Peace Avenue 47, Bayanzurkh District (just west of the Wrestling Palace). Except for those just passing through on the Trans-Mongolian Railroad, most people come to Mongolia to witness the beauty of the endless steppes and deserts of Central Asia, populated by the nomadic descendants of Genghis Khan. Ulaanbaatar is an excellent homebase for an exploration of Mongolia with its many museums, monasteries, and cultural experiences, but don't confine yourself to UB alone: you can't really get to know this place without going to the countryside for at least a few days. This city travel guide to Ulaanbaatar has guide status. It has a variety of good, quality information including hotels, restaurants, attractions and travel details. Please contribute and help us make it a star! This travel guide page was last edited at 03:17, on 15 April 2019 by Wikivoyage user ARR8. Based on work by Wikivoyage users Ikan Kekek, Matroc, Ibaman, Traveler100bot, ShakespeareFan00, Mx. Granger and Wrh2Bot, Wikivoyage anonymous users 213.111.4.76 and 202.179.24.163 and others.